This is a Brand New Kippy's 1 1/2 in. Rose Overlay with Butterfly Buckle. Leather: black overlayed with white Swarovski Crystals: Multi Colored with studs. 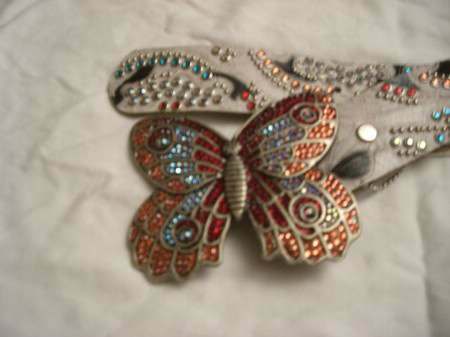 a Buckle: beautiful recessed pave buckle,which features multiple colored Swarovski crystals to create this beautiful butterfly design. SIZE:38 All Kippy's Products Come with A Manufacturers Lifetime the warranty is on Crystals,Studs, and Settings!!! For finding your correct fit, use a belt that you currently own. Wear it in the same place as you will your new belt. Make note of which hole you are using, then measure from the inside edge of the buckle (where the tip sits) to that hole. That is your Kippyís belt size, and that measurement would have you wearing a Kippyís belt on the center of 5 holes. The holes are 1î apart.